The Original 2-1 Keychain Rescue Tool. Made in USA, this 2-in-1, safety and survival tool, allows you to cut a jammed seatbelt and to break a side window in your car. Made in USA - The Original! Materials: ABS plastic |Stainless Steel. Hang from rear view mirror using the zip tie to allow for access for both driver and passenger. 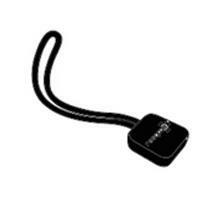 Attach the visor clip to your sun visor, ideal for keyless entrance cars. 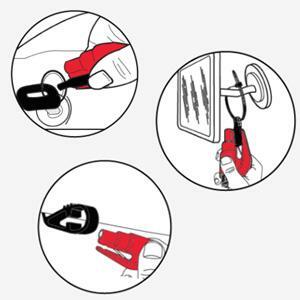 Attach resqme with key ring to easily reach while driving. 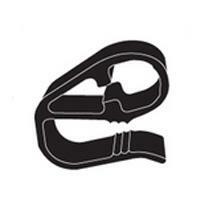 Hang from head rest using the lanyard to allow for access to back seat passengers. 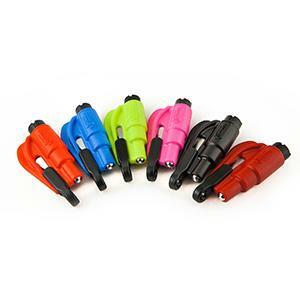 The resqme tool attaches to your keychain with a detachable clip. In the event of an emergency, pull the resqme tool away from the clip to reveal the blade. 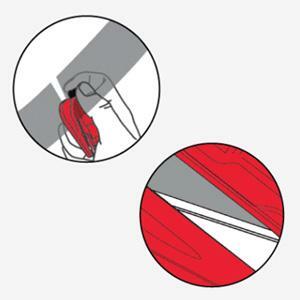 If the seatbelt is jammed, cut the belt by hooking the blade over and slicing it across. To break the window, press the black head of the tool against the corner of the window and it will release the spring-loaded spike and shatter the glass. The resqme tool does not work on car windshields. 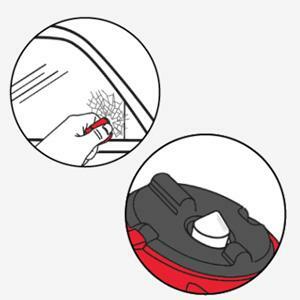 It is effective only against tempered glass commonly used in side windows. How do I remove the safety blade clip? 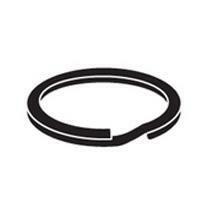 First attach the key ring or the cable tie (or the lanyard if you purchased the Premium Accessory Pack) around the loop of the clip to have more of a grip. 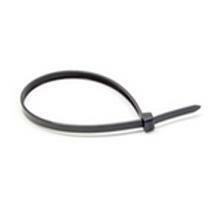 Then unsnap the clip (pull straight / brisk movement) using the key ring or the cable tie around the loop. Please note that without support of key ring or the cable tie it can be a little difficult to remove the blade clip and can cause the resqme to break. Most sunroofs and rear windows are tempered. To figure out what kind of glass is in the side window of your car, you can look in the bottom corner. There may be a label that says 'tempered' or 'laminated.' If not, roll down the window and look at it from a bird’s-eye view. If it’s smooth and looks like one piece, it’s tempered. If it looks like a sandwich with a ridge, it’s laminated. Yes! resqme is designed to be used more than 1 time! The spring-loaded spike resets automatically and can be used multiple times. The blade is very durable and can easily perform multiple seat belt cuts.